Minister of Urban Development Shri M.Venkaiah Naidu has asserted that urban infrastructure sector offers Rs.73 lakh crore investment opportunity for private sector and PPP investments over the next 15 years. He elaborated on this investment potential while speaking on ‘Current status, Outlook and Investment opportunities in developing urban infrastructure’ at the ‘India Investment Summit’ organized by the Ministry of Finance here today. Shri Naidu stressed that given the resource limitations of both central and state governments, private sector investments and Public-Private Partnerships are the chief instruments of resource mobilization to build the much needed urban infrastructure in the country. He noted that the Smart City Mission, Atal Mission for Rejuvenation and Urban Transformation (AMRUT), Swachh Bharat Mission and Prime Minister’s Awas Yojana (Urban), which are aimed at ensuring urban infrastructure offered huge investment opportunities of the order of US $ 1,123 billion. Giving details, Shri Naidu said that over and above the support committed by the central and state governments, ensuring basic urban infrastructure requires Rs.56 lakh crores, building 2 crore houses for urban poor needs another Rs.11 lakh cr and Rs. 6 lakh cr for building 100 smart cities. Expressing hope that private sector and PPP investments can be mobilized to address the infrastructure challenge, Shri Naidu informed that 10 of the 20 smart cities announced last week have laid down clear road maps for mobilizing PPP investments of about Rs.9,000 cr. These include : Jaipur-Rs.2,563 cr, Belgavi (Karnatak)-Rs.1,006 cr, Davanagere (Karnataka) and New Delhi Municipal Council-Rs.797 cr each. Shri Naidu called for ensuring an enabling environment for the success of PPP mechanizing by addressing 6 key hurdles viz., Policy and regulatory gaps, Inadequate availability of long term financing, Inadequate capacities in public institutions and officials to manage PPP processes, Inadequate capacities in private sector including developers, investors and technical manpower, Inadequate shelf of bankable infra projects and Inadequate advocacy to create general appreciation of PPP by stakeholders. Bringing out the gaps in urban infrastructure, Shri Naidu noted that 50% of urban households still do not have water connections, only 69 litres per capita per day of water is being supplied in urban areas as against the norm of 135 lpcd, average water supply is only for 3 hours, sewerage network services cover only 12% households and only 5% of sewerage treatment capacity is available in urban areas. “These gaps hit the urban poor the most and developing urban infrastructure accordingly leads to inclusive urban growth besides enhancing productivity and quality of life” said Shri Naidu. 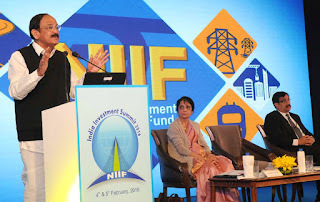 The Minister said that the Government led by Prime Minister Shri Narendra Modi is addressing infrastructure deficit with a vigorous intent, intensity and initiatives to make urban areas more effective engines of economic growth.